The trend in our lives seems to be work, work, and more work, and this leaves the loyal family pet alone for extended periods of time. Pets need exercise and socialization to remain mentally and physically fit. Long periods without human contact can result in destructive behaviors such as chewing, digging, barking, and disobedience to commands. At a minimum it results in a pet who is ready to start his day just as you are ready to end yours. What is a caring pet parent to do? Have you considered dog daycare? Dog daycare works very much like child daycare. It is an organized, controlled, and monitored environment where a group of friendly dogs from multiple families can play and interact with each other. Our trained staff helps dogs interact safely with each other while chasing bubbles, chasing tails, playing with toys and other dogs. We even see to it that each dog works on basic training issues at each visit. Imagine returning home at the end of a day with a dog who's day was as busy as yours! Their needs for mental and physical stimulation have been met, and your biggest worry might now be who gets the best seat on the sofa! Remember, a tired puppy is a happy puppy. Daycare passes need not be used for consecutive days. Passes are good for six months from date of purchase. Reservations for daycare are required, even if it's the day of your pet's visit. Daycare participants are required to wear a quick release collar, no exceptions! This is for the safety of all the pets in daycare. These collars are available for purchase on site. Pets must pass two different behavior evaluations before admittance to daycare. These need to be scheduled in advance. If your pet passes, they may enter daycare the day of each evaluation. Once your pet passes both evaluations, they are cleared for day care any day after that. Some pets are unsuitable for daycare play, and this evaluation helps ensure the safety of the daycare dogs. Each group of dogs has a different dynamic, and we do two separate evaluations in order to determine if your dog can mix with different groups. 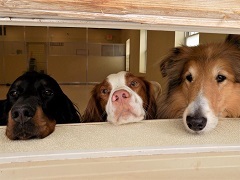 Dogs that are unsuitable for daycare are welcome to stay in our facilities for day boarding with the options of neighborhood walks or private play time to fill their day.